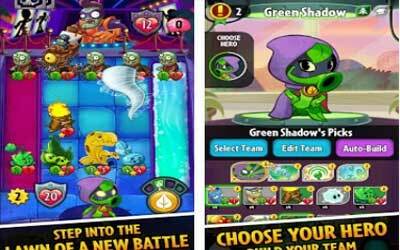 Previous version Plants vs. Zombies™ Heroes 1.22.12 apk for Android will help you to downgrade or install older app easily. This is one of the best Casual apps. PvP action in the game is more suitable to be called a mix between Magic the Gathering with the defense line action. You will duel in a brindle arena, two players will compete with each other strongly with row of cards they have. Similar to the style of original Plant vs Zombie, that arena will be basis strategy to defeat the opponent. There you can set zombie or plant to attack, block enemy, and others. By utilizing the arena, two players will duel with all their cards until one of them lost. Interestingly, player can also choose what kind of hero characters that will represent their avatar in battle, ranging from zombies like Superman, masked bean plants, and more. Each hero that you choose has special attacks. Through its unique model, I’m sure Plants vs. Zombies Heroes will be entertainment for PvP duel card game likes Hearthstone. This game is free for everyone so you can play it for free. I like this game, it runs smoothly with great graphic. Multiplayer game is one of my favorite feature. I can play against my friend.